Our purpose is to bring others to Christ and to be conformed to His image. We meet every Sunday morning for study, worship, and prayer. On the first Sunday of each month, stay after the service for a potluck fellowship meal to celebrate birthdays and anniversaries. 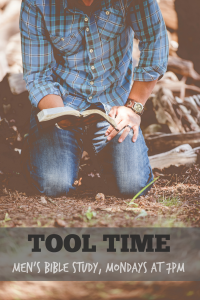 Our men meet each Monday evening at 7pm for Tool Time to pray together, discuss the Bible, and disciple one another. Our Ladies’ Bible study resumes! 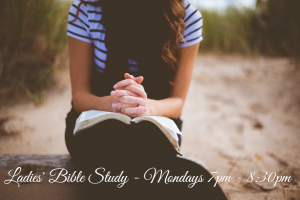 Monday evenings from 7-8:30pm in the sanctuary. Childcare provided by the youth. 2nd & 4th Wednesday nights we have our weekly Operational Leadership Meeting at 6:30, where everyone is encouraged to attend to shape the ministry, direction, and effectiveness of our church body. BACK TO SCHOOL SUPPLY DRIVE. 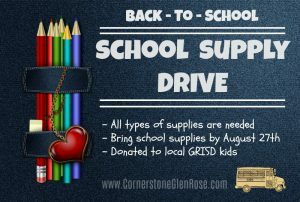 Donate school supplies during the month of August, for local GRISD kids. Bring your supplies to the church by August 27th. All types of school materials are needed. 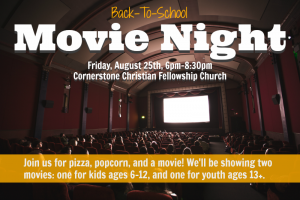 KIDS AND YOUTH MOVIE NIGHT. Friday, August 25th, 6:00-8:30pm. We will be showing two movies, one for youth ages 13 up, and one for children ages 6-12. Pizza, popcorn, and plenty of fun. If you would like to receive an email newsletter of events and reminders, sign up for our monthly newsletter to help you stay informed and get involved at Cornerstone.